Special designs for better contact between yeast and fermented sugar Pre-clarification / Post - clarification of cane molasses. At MOJJ we are customer driven to the core. 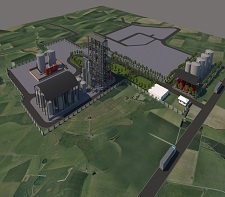 Our distillation plants are customized for quality, consumption and operational ease. We have state of the art specially designed equipments enabling efficient separation of impurities with reduced scaling and down time. MOJJ, for the first time introduced the concept integrated evaporator for substantial reduction of spent wash volume. DDGS is obtained as a bi-product from a grain distillery. Slops from distillation column are concentrated in multiple effect evaporators and the concentrated slope is added on the decanted residue obtained from the fermentation process, which are mainly proteins and the fibrous material of the grain. 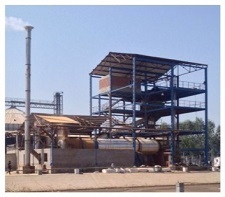 This mixture of the concentrated slope and the residue is dried in indirectly heated rotary dryer or steam tube dryer to obtain DDGS which is used as cattle feed and the distillery truly becomes zero discharge. 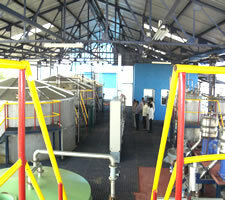 Manufacturing of malt whisky is by blending of malt spirits. 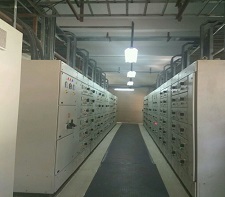 Fresh barley crop is received and stored in barley godown. Before taking in process it is graded and screened and taken to steeping vessels where it is soaked in water. After soaking it is transferred to Germination box where moisture is retained. Warm air by burning Peat is circulated to start germination. Enzymes present in the grain get activated. Just when the grain starts sprouting, process is stopped by taking the germinated grain to kiln where hot air is used to dry it. Now this dried grain is called malt. It is again screened and stored as malt. Dried malt is ground and transferred to mash tun, a vessel with false bottom. Hot water is added then by keeping the mass under thorough mixing. Sugar is extracted from grain and liquid is taken to lauter tun. Solid residue is washed using hot water to remove all sugar and grain is removed from system as spent grain. Liquid from mash tun is filtered and cooled. Cooled liquid is called Malt Brew. This is rich in sugar, minerals and enzymes, which is later taken to fermentation. Malt brew is taken to fermentation and yeast propagated bakers yeast is added to it. Temperature in the fermenter is controlled at 30 degrees C to 32 degrees C and yeast converts sugar into alcohol. Malt brew after fermentation is called wash or fermented wash / beer. Wash is taken to pot still where steam in jacketed or coil is used for indirect heating alternatively a re-boiler is used. Alcohol evaporates faster than water. 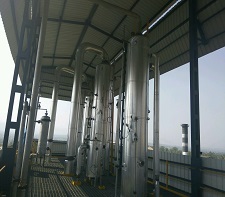 Alcohol water vapour are condensed in the condenser and condensate is collected in alcohol receiver. Alcohol strength of the condensate is checked regularly and distillation is stopped when condensate alcohol strength is approaching zero. Spent wash is drained and pot still is charged again. 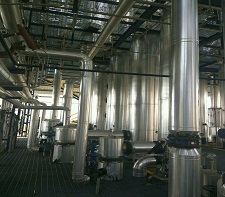 Condensate from 1st distillation is taken to another pot still and controlled distillation is carried out. 1st product is rich in low boiling and is called heads. 2nd middle fraction is final product. 3rd or last fraction is tails. Heads and tails are mixed or collected in separate receiver. These are partially recycled in pot still by mixing with condensate of 1st distillation in next batch. Middle fraction or product is collected separately and taken to wooden barrels or casks for maturation. Matured spirit with specified age is mixed with G. N. S. [grain neutral spirit]. This is called blending. D. M. water is added to adjust strength to desired concentration [reduction] and blended product is taken to bottling section when it is bottled and packed. 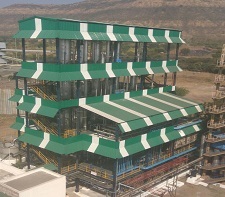 With our experience in drying and evaporation and also of molasses fermentation MOJJ is in a unique position to offer customised solutions for waste water to ensure zero discharge. 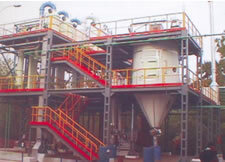 Combining this experience we have given large evaporators for Vinasse/cane molasses spent wash Concentration both in raw as well as Bio Methanated condition. 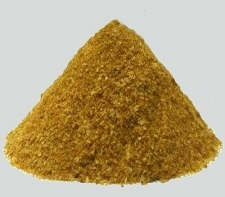 The concentrated Vinasse is processed to get CMS ( Condensed Molasses Soluble) or can be burnt in special design boilers to get net positive energy, or to reduce consumption press mud and required area in case of bio composting.We ensure and guarantee least down time due to scaling in Industry with lowest power consumption. When combined with our integtrated evaporator we also guarantee least stem consumption. Copyright © 2015 MOJJ Engineering.